A new generation of Broyhill is putting his own stamp on the furniture industry. In James Broyhill II’s home workshop in South Charlotte, amid the posters of country crooners on the walls and empty bourbon bottles lining the shelves, a framed illustration of an old wooden blacksmith- and-buggy shop rests against a wall. Resembling a log cabin, the humble building is surrounded by leafless sycamores and the Caldwell County foothills. The blacksmith shop once belonged to James’s great-grandfather, James Edgar Broyhill, or “J.E.,” who left his family’s farming business in the early 20th century and became a national titan of household furniture production. By the 1950s, Broyhill Furniture Factories operated several plants across North Carolina, churning out tables and sofas at breakneck speed. But it was there, in that dirt-floored blacksmith shop captured by a sketch artist, where the future mogul got his start, overseeing the production of footstools and vanity chairs. 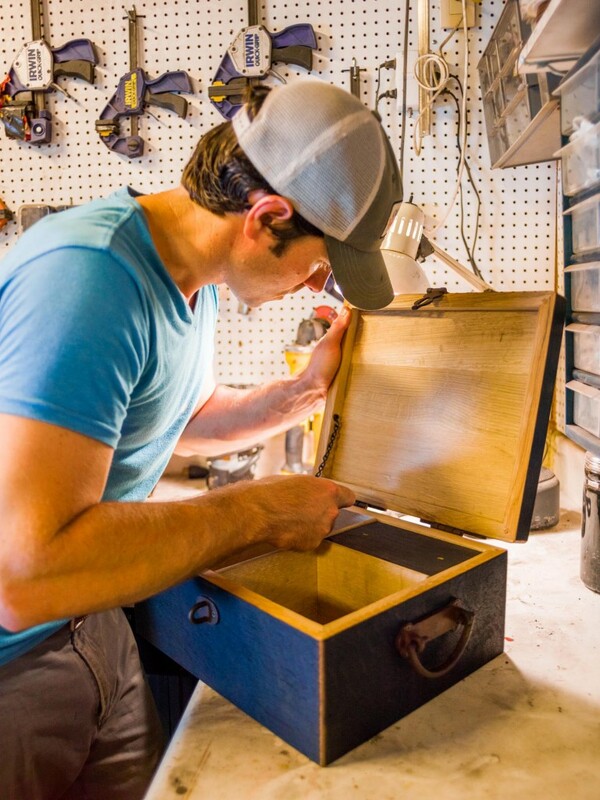 “It motivates me,” says 30-year-old James, who keeps the sketch above his workbench to remind him of his roots — an idea branded into the very name of his business: Heritage Handcrafted. Now, it’s James’s turn to build a furniture business. Since launching his company three years ago, the young woodworker has cornered a specialized market: furniture crafted from whiskey and wine barrels. What began as a pet project in his workshop has grown to include two manufacturing plants and several employees. James counts celebrities among his clients, and is on track for nearly $200,000 in sales this year. His products include tables, chairs, benches, ottomans, chandeliers, sinks, pens, bottle stoppers, cuff links, shaving kits, and gift boxes. Heritage Handcrafted has also found a niche designing custom building products for distilleries and wineries. James hopes to imitate his great-grandfather’s entrepreneurial spirit, building a national reputation out of a pipe dream. But though the goal is the same, the path is quite different. • • •Broyhill Factories was known for producing the “Chevrolet of furniture.” J.E.’s pieces were simple and elegant, but mass-produced for widespread appeal. The Boomer native rose to prominence during a dominant period of furniture-making in North Carolina, when the state led the country in total production of wooden household furniture. Following World War II, about 60 percent of American furniture was produced within a 150-mile radius of High Point, home to the largest home furnishing marketplace in the world, with an abundance of lumber from nearby forests. But in recent decades, American furniture manufacturers have witnessed growing competition from overseas factories. Foreseeing a market downturn, the Broyhill family sold the company for $151.5 million in 1980, eight years before J.E.’s death. In contrast to his great-grandfather’s mass-production approach, James relies on artistry, craftsmanship, and attention to detail, as was the custom when North Carolina furniture was first made by 18th-century workers. Each piece Heritage Handcrafted produces is made by hand — built on a workshop bench, cut by cut, nail by nail. But James feels most comfortable in his workshop, with the picture of the blacksmith shop. Before he begins a new project, the young entrepreneur looks at it. And he reflects. J.E. Broyhill was born in 1892. As a child, he tended to his father’s Wilkes County corn and apple crops, and helped out with his uncle’s lumber business. In 1913, floods washed out the bottomland he rented with his brother to grow corn. It was just as well. J.E. was determined to do something bigger in life than toil as a farmhand. With $5 in his pocket and no formal education, the 21-year-old walked and hitchhiked to Boone, where he enrolled in the public school course at Appalachian Training School (which later became Appalachian State University), where he stayed until he was drafted in 1917. After his war service, the 27-year-old went to work as a salesman and bookkeeper for a brother who ran a furniture company in Lenoir. Several years later, J.E. purchased the blacksmith shop near the Lenoir railroad depot, and built a runway over the tracks to the platform to facilitate furniture shipments. In his first year, he produced more than $150,000 worth of furniture, and used the profits to purchase the entire valley surrounding the building. The postwar boom saw the furniture mogul adapt to new demands for sleek, simplified designs. In the 1970s, he ventured into plastics and expanded operations into Louisiana. By the end of the decade, annual sales had reached $265 million, with 7,500 employees working out of 20 factories. During the second half of the 20th century, however, American furniture began to lose its regional quality, and by 1980, when J.E. and his partners sold the company, the industry was beginning to lose business to Asia. Business would stay strong in North Carolina for one more decade, thanks mostly to High Point, which produced about half of the country’s furniture. But by the 1990s, North Carolina had witnessed the closing of 47 furniture factories, and dozens more have closed since then. Since 1992, furniture manufacturing in the state has been cut by more than half, although, despite the industry downturn, North Carolina is still the largest in the country — about 600 manufacturers employ about 50,000 people and produce about $6 billion worth of furniture. Today, Broyhill Furniture is part of Heritage Home Group, a world leader in home furnishings. The Broyhill family still owns the valley where J.E.’s original blacksmith shop was located. A Charlotte YMCA runs summer camps on the grounds. Shortly after the Broyhill sale, J.E.’s grandson, Ed, went to business school to prepare for a real estate career. In a few years Ed’s wife, Melanie, would give birth to a son, James Broyhill II. • • •In late 2010, James was driving a 12-foot U-Haul through Bardstown, Kentucky. A somewhat bored land investment specialist at the time, he was scheduled to meet a pair of bourbon distillers — brothers who’d recently launched a microdistilling company. In the months leading up to the trip, James had made cold-calls to micro-distillers with a pie-in-the-sky idea: to create furniture out of whiskey barrels. At his home workshop, James Broyhill II carries on a tradition begun by his great-grandfather, but in an entirely different manner. 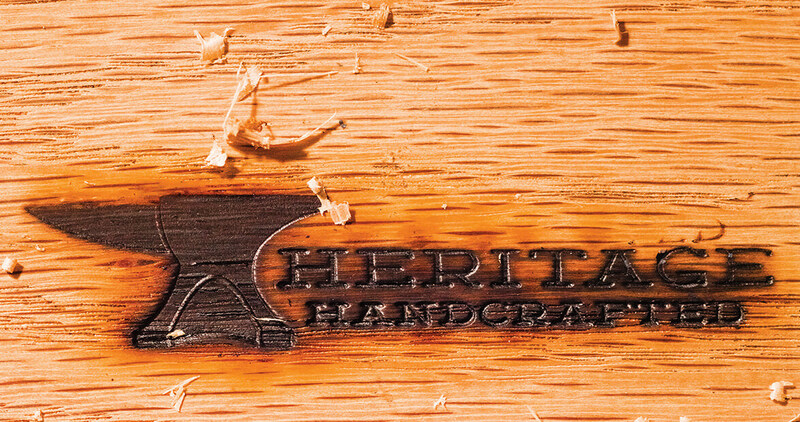 As the trademark proclaims, all Heritage Handcrafted products are made by hand. What’s not revealed in the company’s “branded” name is that the products are also created entirely from whiskey and wine barrels. The idea had occurred to James a year earlier during a visit with his older sister, Elizabeth, to a Nashville farm. He’d spotted an old Jack Daniels barrel that he bought for $100 and stuck in his garage, where it sat for several months. One day, James removed the metal rings holding the barrel together and watched the 32 white oak staves spill out like a budding flower. “I thought they’d all be joined together,” he recalls. He admired the contours of the wood, breathed in the rich smell of whiskey, and thought the wood would make a perfect bench. So the young graduate of Appalachian State University spent the weekend building one in his workshop. Then he built another. Then he began searching for more barrels. Around that time, Elizabeth attended an event in Nashville. The bartenders served Belle Meade Bourbon, a small-batch, handcrafted spirit distilled by Charlie and Andy Nelson, two brothers whose triple-great-grandfather had used the same recipe a century ago at the family-owned Nelson’s Green Brier Distillery. Elizabeth showed Charlie a photo of one of James’s benches. A few weeks later, James was in a U-Haul, traveling to Belle Meade’s then-bottling plant in Kentucky. During the road trip, he felt giddy, though slightly unsure about the idea. The deal completed, Broyhill returned home with the barrels in his U-Haul. He figured they’d last him a year. They lasted 90 days. Friends and family began calling him with requests. The next year, a friend mentioned to a local publication that James’s barrels might make a good story. James didn’t have a website. He didn’t even have a name for his business. On the fly, he created Heritage Barrel Designs, which he later changed to Heritage Handcrafted. The name “Heritage Handcrafted” wasn’t just a gesture to J.E. Broyhill, Lenoir’s foremost furniture magnate. The title is also a nod to another one of James’s ancestors: his maternal grandfather, who taught James how to be a carpenter. Growing up in Winston-Salem, James was a rambunctious child who required constant attention. His grandfather, Timothy Pennell, a casual carpenter as well as a general and thoracic surgeon for Wake Forest Baptist Hospital, gave James a hammer and put him in his basement woodshop. “That made me stop wrestling my brother, Penn, and terrorizing the house,” James recalls. Soon the 7-year-old, strapped with goggles, was building furniture at his own bench, unsupervised. He discovered that he was good with his hands, that he used like a surgeon himself. After months of hiccups and setbacks, Heritage Handcrafted took off in 2012. James befriended local cabinetmakers and joined the Charlotte Woodworkers Association and the Western North Carolina Woodworkers Association. Like his great-grandfather, he built the business through partnerships across the state. James now has three bourbon partners as well as a Cabernet partner who offers barrels with a rich red patina. He goes through 12-15 barrels a month and aims to be the largest manufacturer of reclaimed wood in the country, doing his part to bring jobs back to North Carolina. James credits his success to his forebears. He developed his passion for the trade from J.E., who powered through the Depression by taking risks, laying down capital, and solving problems. And he inherited his attention to detail from Pennell, who taught him to slow down and see each project through to the end.